Mazda MX-5 expresses its superior handling ability through its sculptured yet simple look. Its lightweight body and exceptional design allow you to truly experience the exhilaration of driving in the open-air. 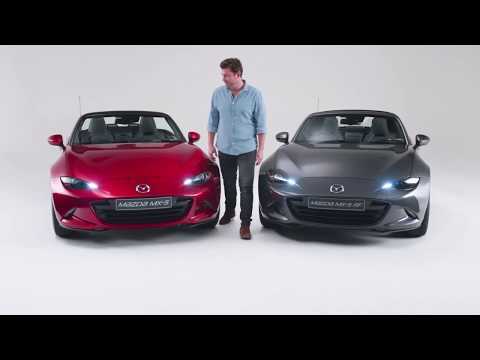 Mazda MX-5 contains an array of intelligent safety technologies that are designed to help you connect with your car and enjoy the drive. This is thanks to the i-ACTIVSENSE technologies, an outstanding collection of safety features that use sensors and cameras to monitor your surroundings and provide protection and convenience. Connectivity is key in Mazda MX-5 and via a compatible mobile device you can access thousands of internet radio stations from around the world, safely check and reply to text messages, and even keep up to date with Facebook and Twitter*. Enjoy streaming your choice of music via a Bluetooth® connection. All of this is easily controlled using the 7’’ colour touch-screen display and the intuitive Multimedia Commander, leaving you to concentrate on enjoying the drive. *With compatible mobile device. Data usage and costs will vary. For further information please refer to the infotainment specification table. SKYACTIV Technology is all about making driving more fun. Embracing all the technologies – engines, transmissions, chassis and body – it’s an approach that completely reimagines the car from the ground up. Coupled with rear wheel drive, 50:50 weight distribution and a lower centre of gravity, SKYACTIV Technology enables Mazda MX-5 to deliver its thrilling driving experience, balanced with outstanding environmental and safety performance. Important Information : Retail sales only, subject to availability for vehicles registered between 01.04.19 and 30.06.19 at participating dealers. T&C apply. ~0% APR and *4.1% APR Mazda Personal Contract Purchase available on all new Mazda models. At the end of the agreement there are 3 options: (i) Part exchange the vehicle. (ii) Pay the Optional Final Payment to own the vehicle or (iii) Return the vehicle. Further charges may be made subject to the condition or mileage of the vehicle. Finance subject to status, 18s or over. Guarantee may be required. Mazda Financial Services RH1 1SR. Channel Islands and Isle of Man excluded. Not available in conjunction with any other offer unless specified.